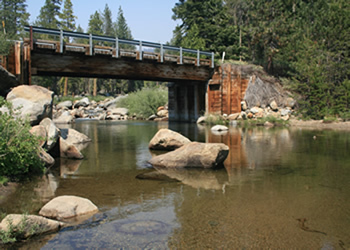 The Clavey River begins its journey within the Stanislaus National Forest in the Emigrant Wilderness and is one of the most scenic rivers in the area. It is also an untamed river ...i.e., undammed river. The picture you see here is one of the few bridges crossing the Clavey and depending upon the amount of snowfall during the winter, some of the ford crossings may be impassible because of heavy spring runoff. At this location there is a lovely pool where one could swim or fish although the water would be quite cold. Obviously, as summer progresses, the water recedes and there may only be a small stream, if anything by early/late fall. Besides parking on the west side of the bridge, there is also an area across the bridge on the left where one could set up a camp. Both of these areas are popular for fishing and it may be difficult to park especially on weekends. 4N26 and 4N25 are well-maintained paved roads. 4N09 and 3N29 are dirt roads and quite rough in many areas. A high-clearance vehicle would be best...however, I suppose one could take a conventional vehicle and pick your way around the potholes and rocks but this would not be recommended. It would be impossible to drive across Lily Creek without a high-clearance vehicle in spring or early summer, and depending upon the height and current of the water, it may not even be safe to do so in any type of vehicle. To learn more about the Clavey River, and also as a wild river enjoyed by expert kayakers, please go to the below Web sites. From the Summit Ranger Station on Hwy. 108, drive west to Crabtree Road (4N26), approximately 2 miles and turn left. Continue for 6.8 miles to just before the pack station on the left and the large Aspen Meadows sign on the right. Turn right onto 4N25 at that point and continue on the paved road for 5.4 miles to 4N09 where 4N25 deadends. Make a left onto 4N09 and continue for .5 miles where 3N29 begins on the right. Continue on 3N29 for just short of 2 miles. You will see the bridge and can pull off the road on the right. As stated above, to reach the Cascade, drive across the bridge and continue for 1 mile to where the road fords Lily Creek. Footnote: When turning onto 4N25 at Aspen Meadows, there is a small sign indicating the Sierra Grandstand Drive. See the page under Locations for information regarding this ride. Another Footnote: Always be cautious before fording a river, creek or stream because you do not want to stall your vehicle in the middle.